“Inventing Abstraction 1910-1925,” the current exhibition at Museum of Modern Art (MOMA), New-York, consists of the most significant and majestic abstraction pieces to New York, including the works of the famous Russian artists Malevich, Kandinsky and Tatlin, who were at the forefront of this spectacular revolution in 20th-century art. MOMA has one of the most important collections of Russian avant garde art, thanks to the museum’s founder Alfred Barr. He laid a strong foundation by bringing pieces from Russia and all over Europe in the early 1930s for the famous exhibition “Cubism and Abstract Art” in 1936. 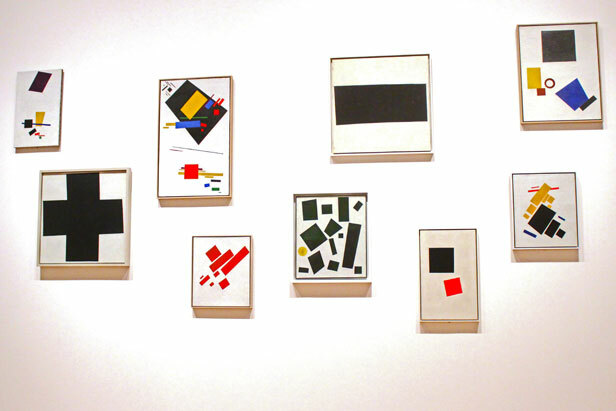 Malevich left some of his paintings, f.e. “White on White,” in Germany and Barr brought them to MOMA. It is on display at the current show.